Thought I would iMovie document this years toys. Had a little difficulty with a new iMovie software, but I think when I finally get the hang of it, it will be for the better. 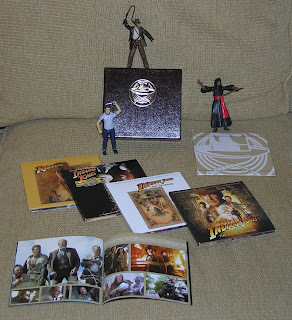 I am really enjoying this long over due almost complete Indiana Jones Soundtrack collection. Last Crusade is amazing with around thirty minutes of previously unreleased material that really changes the whole score. The only big complaint would be tracks 14 and 15, tank music that I constantly whine about is not all on one track, and is segmented not how it is in the film (BUT, its close enough). A minor flub is some of the unreleased stuff sound a bit wobbly as if taken directly from original reels left in wet basement over the years. AND i guess they could have added something new for Crystal Skull, and not just the exact same soundtrack I bought earlier in the year. That being said, its major fantastic to hear these scores complete, finally! I hear there is now a full complete Dark Knight soundtrack out. Erg, thats nice to know after I wasted my money the first time on the regular version (which skips!). AND the new soundtrack is around 50 dollars. Uh hello, thats a bit excessive for a soundtrack. 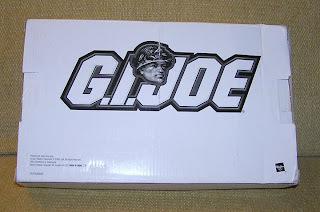 It has a stupid nice box, and stupid picture booklet. Who the heck wants that??? Its about the music, duh?!! And why charge twice the DVD price? How lame! LalalalalaRecords has released original Batman the Animated Series music! I can not believe that in a million years, very excited about that. 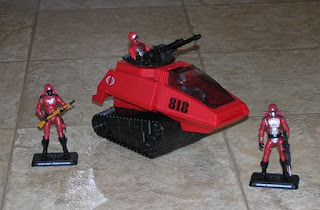 Santa delivered a red HISS tank to the Cobra Crimson Guard. Now the Guard have been patrolling our kitchen floor for the last few nights. Not sure what they are looking for, but they are starting to scare me again. If I had to squeeze all the best movie soundtracks onto one regular music CD for 2008 here would be the playlist. I usually favor big blockbuster, superhero, animated, stuff so if Benjaman's Pants music was any good, I missed it. For Best score of the year I would go with Wall-E. Very good spacey/robotic music. Although I thought i was strange that Wall-E's space rocket ride was very similar to the visual opening credits to Star Trek Voyager. I wish the Get Smart soundtrack had more than just a few small tracks, the theme is classic and fun when modernized. I listed four Quantum of Solace tracks that were both the loudest, and the short ones tried to catch a blip of the bond theme. I just Red Boxed the Mummy; Tomb of the Dragon Emperor the other day, and liked the score. The Mummy franchise has done well with rousing adventure themes (although, I bet the second two films would have been fantastic had Jerry Goldsmith's original themes were used). Speed Racer had a great overall score, lots of action music tracks for many of the races (that movie I still need to see, but I here it is great if you expect it to be from a cartoon, which it was). 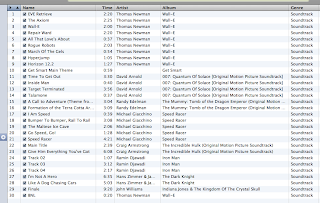 The next few tracks are the stand outs from The Incredible Hulk, Iron Man, and the Dark Knight. The new Hulk full CD is supposed to be great with 2 CDs full of music, I will have to invest in that soon. Iron Man is okay, if you prefer more electronic rock music. Dark Knight follows well from Batman Begins. The Joker 'one note' theme is creepy and well toggled with the Batman Hero theme. Watch out for the CD release, I had to return my first CD, for a new one because the last second of the last 16 minute track was messed up. It would crash iTunes, and skip on a CD player. I returned for a new one, but it did the same thing. Luckily its not the best track, so no big worries, unless you want the whole thing. So there you go, if you care to sample the best music of the year of movies. Unless I missed something, which I usually do but find out ten years later. So far he has instructed me to spill the Nyquil and drink the Tylenol. That seems to be workng for me, less of a drug hangover in the mornings. 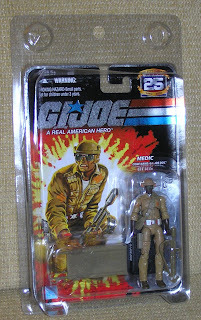 I'm still amazed I got the special order for Doc in on time fifteen days late. Looks like my child like writing skills begging for forgiveness for being late helped out. They probably thought I was some poor sad kid wanting the toy. Oh wait, I was. 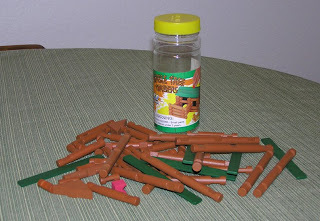 An early holiday gift from a coworker, Tumble Tree Timbers aka Lincoln Logs for the desk! Took lots of hard thinking, but I was able to build the house on the label. Hope I can come up with my own designs. Now I just need to find the right size figure to live in this thing. 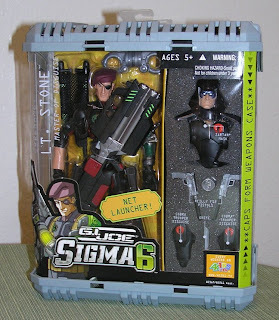 Lt. Stone Sigma 6 Master of Disguise he is! I thought this was a last years toy, not a this years. Silly Toys R us. 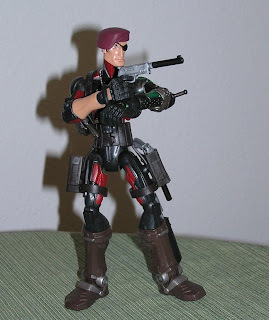 I like Lt. Stone, must be the Flint like resemblance but with an eye patch and a robotic arm. 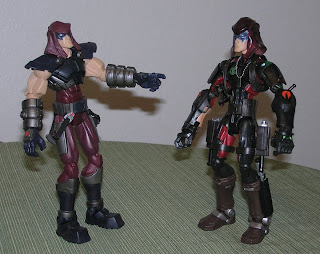 Zartan isn't fooled by this disguise, Stone's Sigma Six badge is clearly visible. 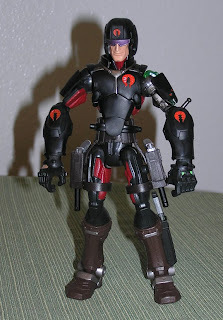 The Cobra Trooper disguise is better than the generic Cobra Trooper toy they never sold. 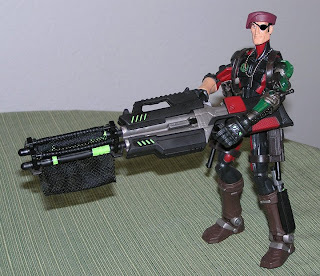 You have to have a giant net gun when you're in a Sigma 6 toy line. 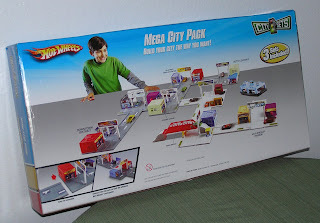 Hot Wheels Mega City USA- They still make that?! I guess if the plastic molds still exist, use em, and sell it again! 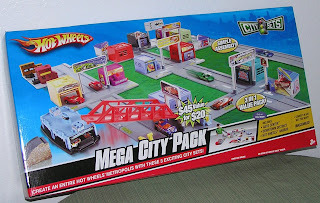 This was always the best all around Hot Wheels city playset you could have. Build the layout of the city in a variety of ways. This updated set does prove you done get all the bells and whistles like you used to, it is missing the bell for the fire station! If that IS a fire station, looks like a repair shop now. 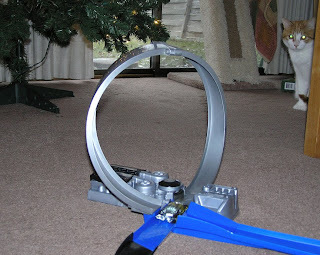 Its also missing the fantastic feature of 'guy on a plastic spiral strip walking across the street." It always worked funky though, being coiled up in a building for so long, he usually flew out of his tunnel. The set does still have the neat red raising bridge, fairy boat, various hidden building car launchers, and one sort of working stop light. Since I already had my fun with this set years ago, I will give this set to my nephew for Christmas. Of course he might have to fight me for it at the last minute. Here's a quick demo of the Hot Wheels Batman Bat Cave Training run set. Basically the same thing as a normal Hot Wheels starter set, only it comes in black and blue, has a Batmobile, and a DVD of great Batmobile chases. It generates some pretty fast speeds with those little metal cars. Kind of makes you wonder how toys like these get through the 'no fun at all' parental groups. If I were to take just one track piece off, it could become a deadly weapon. Better yet, I would like to buy a few more of these starter sets, sequence about five boosters together in one straight shot and see if I can launch a car through a window. Of course I tried to get Bart in on the action, but he wanted nothing to do with this close up. for four exciting new episodes! 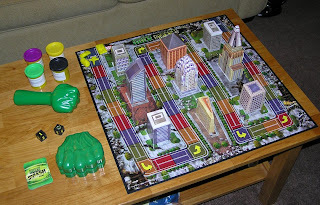 One of the best games of 2008 is The Incredible Hulk SMASH! What a riot. 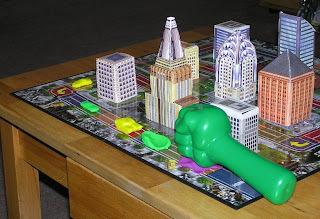 It first appears as a simple race around the board game, but with game pieces made out of Play-doh that can be destroyed by a Hulk fist, things get out of control fast. Basically you roll a dice, move that many spaces. If you roll a Hulk fist, you draw a card that indicates what color block gets smashed. If you have a game piece thats on that colored block, it gets smashed and left there. So after awhile there will be smashed game pieces all over the board. Luckily to speed things up, you can hop over smashed pieces. You play with two pieces at a time, and the goal is to be the first with two pieces at the finish line. If you get smashed, you can remold more pieces and restart. Also, a building can be smashed, and everything adjacent to it gets smashed as well! I recommend the car and the tank game piece, the plane is really weak and floppy. The fire truck, doesn't look as cool. 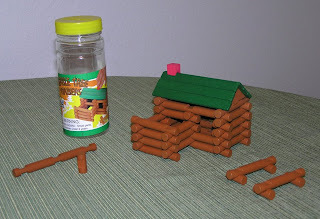 The game says its for six years old and up, but that wasn't stopping me from eating the Play-Doh.